It is hard to believe that there are no prior postings for this somewhat famous, ill-fated airliner, so thought I would start one. The Comet was originally developed back in 1949, but did not actually fly until a few years later. As many have doubtless heard, it had a very unfortunate, tragic record, at least in its early life, with several of the planes coming apart mid-air due to structural failures. I won't recount all of those here, but because of it, many advances and cautions in future jet airliner design resulted, including the subsequent design of the Boeing 707, which came out right after the Comet. Meccano released this model in October, 1954 and the attached image shows the announcement in the 1954 U.S. catalog. The registration number used, G-ALYV, was originally assigned to one of the planes, but this aircraft crashed in Calcutta, India, in 1953, so Dinky subsequently, and belatedly, changed the tail number to G-ALYX, which later models reflected. Somewhat later, the tail color was also changed from white to blue. This was a very long lived model, being in production from late 1954 through 1965. When this was introduced in late 1954, it was listed as a Dinky Toy, and not as a Supertoy, even thought the first box was the familiar white and blue striped Supertoys box. Sometime in 1955, the model was elevated to Supertoys status, and also renumbered, along with the whole Dinky range. The number changed from 702 to 999, so the box was changed to show that new number, and the underside of the plane changed also; raised areas were added so Supertoys could be added and the number changed. My only example of this very nice looking airliner is a very early version, with the inside box lid showing November, 1954, so I believe I received this in 1955, when I was 10 years old. Thus it shows the early numbering and lack of Supertoys labeling. I will leave it to others to supply later examples. And here is the successor, G-ALYX. It bears the number 999 below the wing, and the numbers 702 on the box have been overpasted with oval stckers 999. Unfortunately the stamp inside the box lid is unreadable, but this example must be dated 1955-1956. Jan---I read your very nice, in-depth article on TMT, and it is a real shame that you cannot paste and copy that and other articles into this website. What a waste of great and wonderful efforts by you and many others put into posting there, and now not able to share it. But thanks for adding to this topic with your post on the later version, and hopefully others will follow. 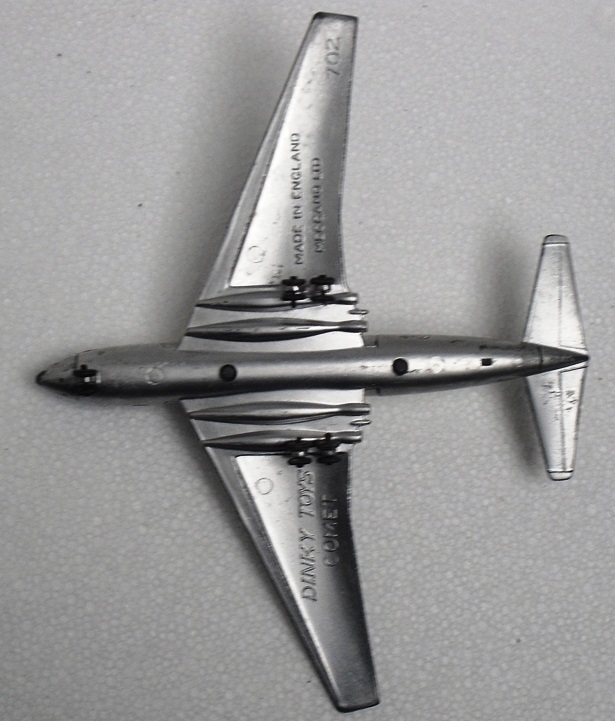 The de Havilland Comet 1 G-ALYV, the subject aircraft of Meccano's model No. 702 crashed 32 kms north-west of Calcutta's (Kolkata) International Airport, India, on its return flight to London from Singapore, via Bangkok and Rangoon. It was determined that the cause was structural failure due to a bad thunderstorm that was in the area at the time. The actual identity of the aircraft was not made public until after a further Comet 1 was lost and the establishment of a committee to look into the causes for the problems of the Comet aircraft. One of the major structural problems was found to be the shape of the square windows and the method of fastening this component to the pressure fuselage. When tests were carried out using a Comet immersed in a tank of water, stress cracks formed around several windows when the fuselage was pressurised. This design fault resulted in a change with the window shape from square to round. By the time the identity of the Comet became known to Meccano, a substantial number of models had already been produced during September, October and November 1954 as well as literature, advertising etc. It was not until the middle of 1955 when the model number was changed the information of which came from Pete Golden. His 702 in a 702 Dinky Toys box has 999 over the inscription 702 under the wing. At this stage it is not known whether the model was switched. However, I have seen the original Dinky Toys 702 blue striped box with 999 glued over the top of 702. The Inspection stamp was MR 157. Another model, this time in a DINKY SUPERTOYS blue striped box numbered 999, but still with the original registration of G-ALYV, with the model number under its wing changed to 999. The registration with advertising literature appears to have been changed from G-ALYV to G-ALYX on or about May 1959. Certainly my 999 G-ALYX was inspected in September 1959. The drawing on the box has the model with an all-blue tail with the registration picked out in white together with a white "Speedbird" athough the model itself has the original white tail with the registration and lines in blue. It is interesting that although Meccano changed the registration from G-ALYV to G-ALYX as a result of the fatal accident to the former, Meccano did not change the transfer for the blue cheat line that incorporated square windows to round windows of which G-ALYX was subjected to in real life. Again, it was made as a toy, and Meccano did go to extra-ordinary lengths to keep their model away from an aircraft that crashed with loss of life. I suppose the easiest way of overcoming this dilemma would have been to eliminate the BOAC markings altogether, and just have a model of a Comet 1 without any airline markings. However we do not know whether BOAC actually provided some capital for the production of this model, which at the very start of airline operations with the Comet would have given BOAC a marvelous advertising tool through little boys and their toys encouraging their parents to fly in a Comet! This would be the only plausible reason for all the trouble taken with changing the model's registration markings although its subsequent Sales Number alteration, may have been inevitable with its reclassification to a Supertoys. Bruce--I also wanted to thank you for your well regarded thoughts on the changes to the Dinky Comet airliner. It sure seems to make sense, although they sure waited a long time to change that registration number. To me, that also raises the question of just how well known the various registration numbers on aircraft are. In the past, I never paid any attention to them at all, so I also wonder just how much the public would recognize either of those numbers. To me, at least, the identity of the just the Comet alone was the single biggest issue, I guess followed by the fact it was a BOAC plane. For those interested, there is a lot of history about the Comet and all those accidents, plus the resultant testing that went on for some time to identify just what had failed and why. I seem to remember that both those square windows, their rivet attachments, plus the joining of the cockpit nose section to the fuselage, were all failure points. Since the Comet was a pioneer jet airliner, the rest of the fledgling industry learned a lot from those tragic accidents, and Boeing admitted as much. I still think the Comet was one of the most handsome airliners ever built, and it stll has classic lines. A very sad story indeed, and the whole episode must have caused some angst for Meccano. Thank you Terry for you kind words. The Comet was the benchmark for modern air travel, and Boeing, as well as Douglas and Sud were very keen observers. My first sight of a Comet was only this year at Duxford Imperial War Museum where Comet 4 G-APDB previously owned by Dan-Air London but painted in the colours of its first operator, BOAC. I spent a lot of time examining this wonderful flying machine, but due to its size and that it is sharing a huge hanger with many, many other aircraft it was impossible to adequately photograph it. These are some of my poor photography attempts! Bruce--That had to be interesting to actually see a real Comet.....such a rare bird now! And trying to take photographs of a full size plane is indeed a challenge.....they are just too big, but thanks for getting what you did. I remember very well seen the Comet in the pre-fabricated tank at the RAE Farnborough in the late 50's.Today Farnborough is becoming the fifth London airport for charters and executive jets. Alfa - X-ray at Heathrow in 1953. The Dinky Comet was a type 1 Comet. 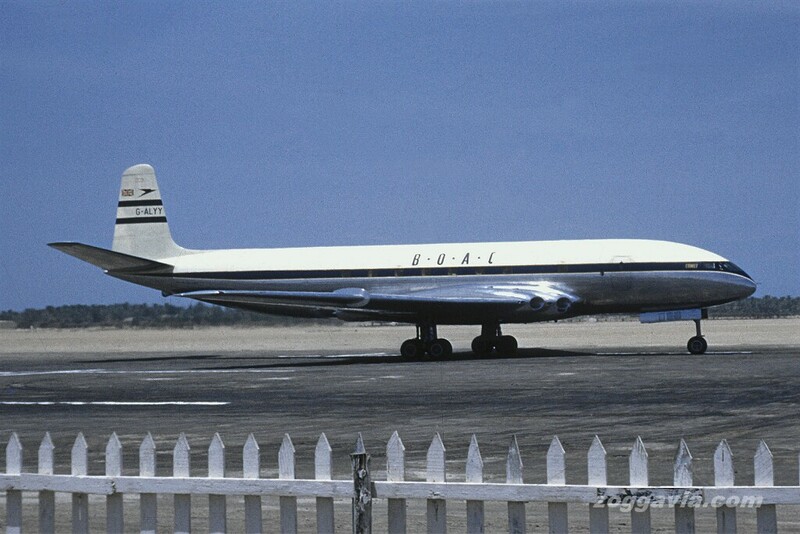 Frame 6022, G-APAS, ex-Air France F-BGNZ, exists as the only surviving and in-tact example of a de Havilland Ghost-powered Comet 1 series aircraft. Converted to Mk. 1XB in March, 1957, the aircraft was re-registered XM823 and subsequently as G-APAS; its final flight was made on 8 April 1968 and the aircraft was thereafter retired. Currently residing at the Aerospace Museum at Cosford, near Shifnal in Shropshire, England, "Alpha Sierra" appears to have been remarkably well preserved albeit in open air storage for more than thirty years ! Yes Jacques, the Dinky model was indeed a Comet 1, and top marks to Meccano for having taken the initiative to provide us with a model so soon after the Comet entered service , but sadly selecting the registration for one that ultimately crashed. G-APAS the subject of your post above indeed spent many years outdoors but has now been refurbished and on 4 December 2006 was moved into Hangar 1 at Cosford, and is now assured of long-term preservation as a significant part of the RAF Museum collection. 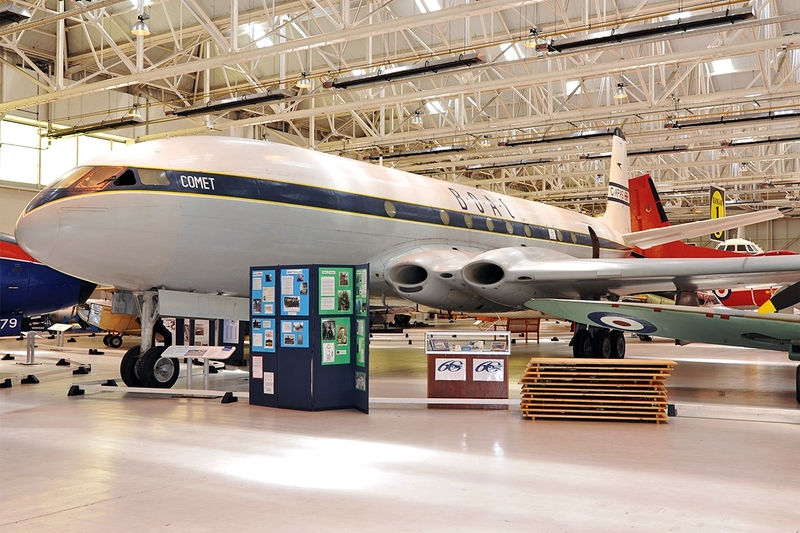 It is painted in the colours of BOAC although it never served BOAC having been delivered to Air France on 22 July 1953, remaining with Air France until 11 January 1954 when it returned to the UK for modifications as a result of the other Comet crashes. Interestingly, the fuselage at the de Havilland Heritage Centre of which I referred in my last post also flew with Air France its constructor's number being 6020 with G-APAS above being 6022, the third last and last Comet 1 constructed. The images below are of G-APAS at Cosford and the former F-BGNX, caption and its nose section. Jan---That is very interesting; I seem to remember reading something about them sharing that cockpit nose section, but did not think too much a out it. That is a great photo showing them side by side, and the two Dinky's definitely show that similarity. Nicely done! 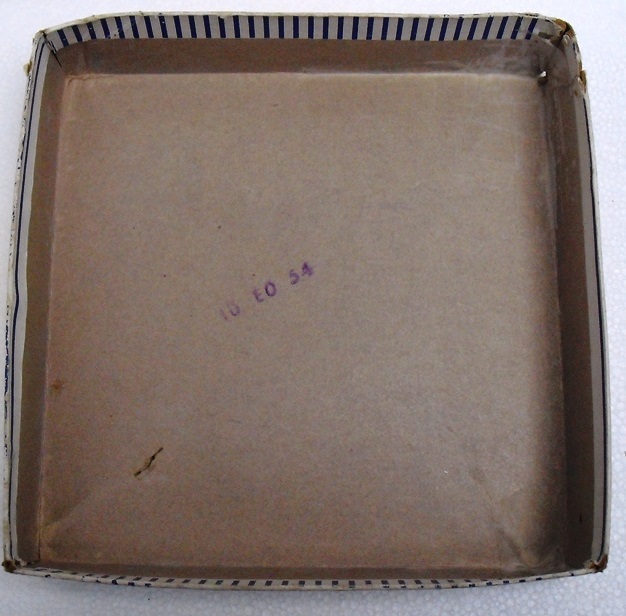 Can you please add a photograph of the inside of the lid of your model's box showing the quality inspection stamp to the above images? Bruce--Here is a photo of the box, as well as one of the quality inspection stamp inside the box lid...........let me know if you need anything else! Thank you very much Terry. Have added the details including the initials of the inspector to my ever-growing data base. Now, if only I could obtain similar to all your other lidded boxes as well as the smaller end-flap Dinky Toys boxes without causing a severe breakdown with our friendship!! Bruce--I will be glad to as soon as I can. Bruce, Terry, some more - hopefully clarifying - pictures of my example and its box. 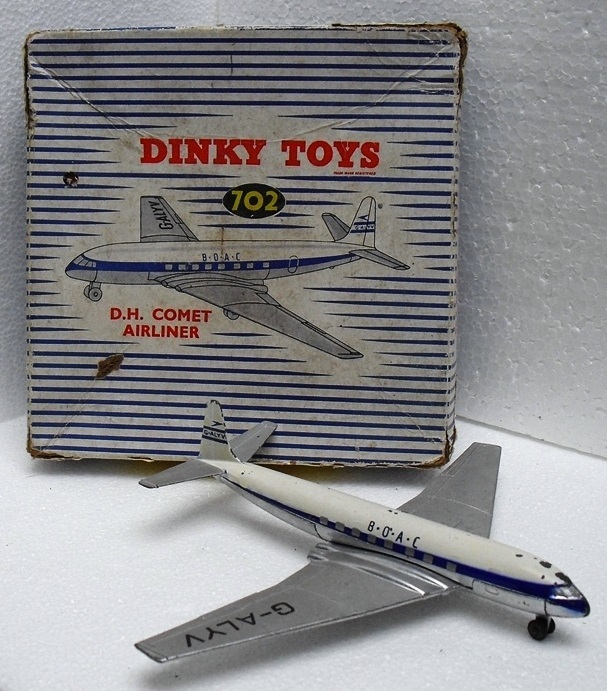 Although the model is already marked 'DINKY SUPERTOYS' on a raised cartouche below the starboard wing, the box still bears the DINKY TOYS brand name. The '999' numbers on top and the sides of the lid are all oval stickers, two in black, one red. Whereas the model shows the new registration number G-ALYX on top of the starboard wing, the box still shows a model with the old G-ALYV registration number. Possibly this very model came in a box from slightly older stock or was this habitual for this whole batch? It is remarkable that the 'G -' on the model is of a different (fatter) typesetting than the subsequent 'ALYX'. The old letter combination shows all characters on the early models in the same (fat) letter type. I cannot find an expected box with 'DINKY SUPERTOYS' in straight characters. The next box seems to jump immediately to italic letters for the brand name, the correct new registration number and the model shown with blue tail. I do not manage to decipher the control stamp inside, I just made a picture with increased contrast, hoping this will do for Bruce. Well some pictures to follow, kind regards, Jan. I was somewhat surprised to see Meccano still usng old box stock for the re-numbered 999, especially in view of the use of stickers over the original 702 salesnumber on the box. Your moel was quality inspected in December 1959 whih shows a late production, and one quite unexpected. I state this as my 999 is in the new box with DINKY SUPERTOYS in italics as well as the change of the drawing to show he new registration letters wth the transfers for the registrations on my model being inner han yours. And yet i wasquality inspeted three months BEFORE your moel! Do not ask me how this came about, as prbably eve Meccano had no idea! I am leaving th text in thi Post as Al wats t see what is happenin wit typing on my computer. I will re-do this message correcting all the mising letter and spaces. I was somewhat surprised to see Meccano still using old box stock for the re-numbered 999, especially in view of the use of stickers over the original 702 sales number on the box. Your model was quality inspected in December 1959 which shows a late production, and one quite unexpected. I state this as my 999 is in the new box with DINKY SUPERTOYS in italics as well as the change of the drawing to show the new registration with the registrations on my model being thinner than yours. And yet it was quality inspected three months BEFORE your model! Do not ask me how this came about, as probably even Meccano had no idea! I am leaving the text in this Post as Al wants to see what is happening with typing on my computer. I will re-do this message correcting all the missing letters and spaces. Continuing with my message, I presume the windows on your model are still square. Actually you mentioned about the thickness of the registration letters in our Post but I was in a hurry to type a message to enable Al to see the mess my posts would have been without spending ages correcting missing letters etc!! As you have never encountered a box with block lettering for DINKY SUPERTOYS that the change occurred during 1957 as it was this year when italic printing was introduced. 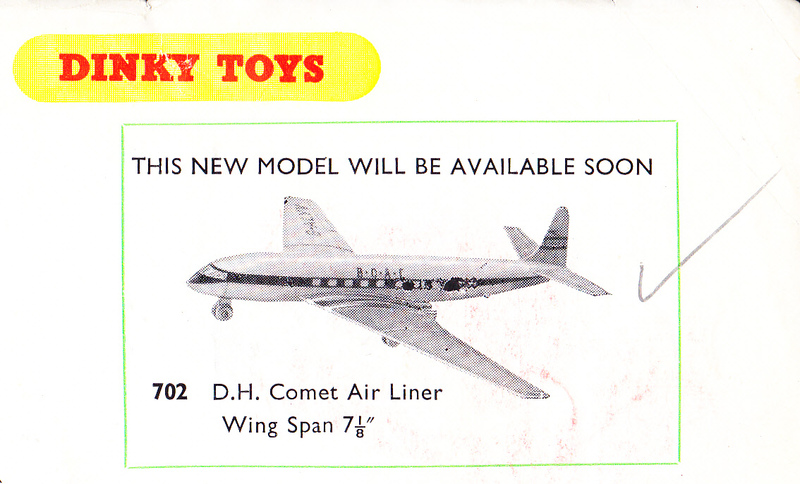 Finally, the tail on my Comet is identical to the original 702 - white, although the drawing on the box shows the blue tail. This is an other evidence that Meccano never trashed anything. If there are boxes left over and they can be used by adding stickers, they will be used. They have done this many times. This made me check the Comet page of Dinky Toys Encyclopaedia, it is missing a picture of the DINKY SUPERTOYS white box with blue strips. Can any one please supply a large picture of this box. Do you mean something like these two images? Most of you will have read Jan Werner's article on the 702/999 De Havilland Comet on the Talk Model Toys forum and, like me, have wondered why it was not possible to cut-and-paste it here. I felt that it was worth the effort to try again so I shall now make the attempt. As I said to Jan, we shall know shortly whether I have been successful! Here goes! The Dinky (Super-) Toys no. 702 / 999 D.H. Comet Airliner had a considerably more successful life than its real-world counterpart, the De Havilland Comet I, the first operational jetliner in the world. Following six crashes the plane was forbidden to fly. Only one of these accidents seems to have been due to a human error, the others were due to the plane, especially problems with fatigue and the pressure compartment. The model consists of two main diecast components (as usual for most Dinky planes of this size), the upper half of the fuselage with the tail, and the lower half of the fuselage with the main wing(s) and main landing gear, bolted together. Contrary to the French larger planes, the blue band, which stretches at both sides from the nose section back to the tail of the model, has been painted instead of using transfers. Until ca. 1955 the registration number of this Dinky Comet, applied on the starboard wing and both sides of the tail fin, was G-ALYV. Then it was changed into G-ALYX. In this year the model itself was renumbered as well, from 702 (in the original aircraft number range) to the high Dinky Supertoys number 999. Some old stock of no. 702 Dinky Toys boxes were given the 999 number by applying neat little red and black oval stickers over the old numbers on the boxes. The renumbering was applied to the die as well. 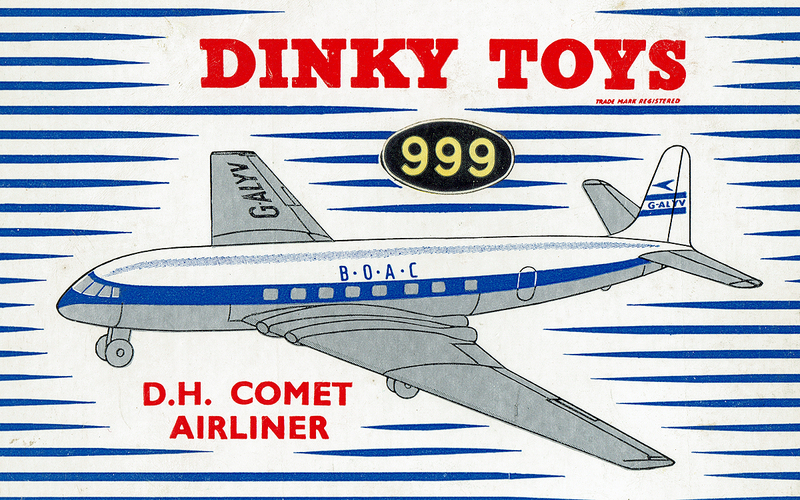 On raised ‘cartouches’ (deepened in the die) the changed brand name wording ‘Dinky’ and ‘Supertoys’ appeared under the starboard wing and the new number ‘999’ under the port one. The wheels, which were made in a rather yellowish finish in the beginning, made a change into a more white metal appearance then. The 1962 catalogue picture and its setting is rather remarkable, as the artwork below shows the innovated Comet 4B in the new BOAC finish with blue tail, whereas the model shown is of course the available, old-fashioned, ill-fated Comet 1. Around 1964 the silver finish was replaced by grey metallic and at last the tail wings and fin got the modern dark blue colour, which the actual early 1950s plane of course never had. Some pictures of the model (like the above) seem to indicate that also new transfers were applied with the more narrow wording ‘B.O.A.C.’ They seem to be discoloured sometimes, which may indicate that they were water based, like the French ones, rather than the bright sprit based ones. Somebody of you may explain or comment on this, I have no such examples. The wing registration numbers seem to have become heavier, fatter too. The box was adjusted every now and then according to the fashion of the Dinky boxes. Apart from the designs shown above I presume there are also striped boxes with straight DINKY TOYS characters but PRINTED nos. 999, and boxes with straight and later italic DINKY SUPERTOYS print. The model was prevented from moving too much in the box by a wrap-around piece of card board, with flat openings to hold the wing tips in place. Still, one can hardly find an example of this model which does not suffer from rubbing paint damage on top of the tail fin, which hits the inside of the box lid permanently. In fact this happens with most of the plane models, but it is more obvious on the ones with a white painted tail. Although the model was deleted after eleven years in 1965, its life had not ended yet. The die was sold to India in 1968, in order to be used for producing the Nicky Toys Comet. Although the lettering on the transfers remained the same, new transfers seem to have been introduced again then. Only the tail fin (and of course the blue band along the fuselage) remained blue in finish, the rest of the tail plane wings turned into silver again. This final version also had fewer cabin windows and Nicky continued the original Dinky catalogue number 999. The Comet model was really a good job, a faithful reproduction as it is of the real plane (with all restrictions of the time and Dinky style), with correct details (as far as reproduced). The model’s nose cone witnesses the similarity with the nose of the French Caravelle, which both of them shared in reality. 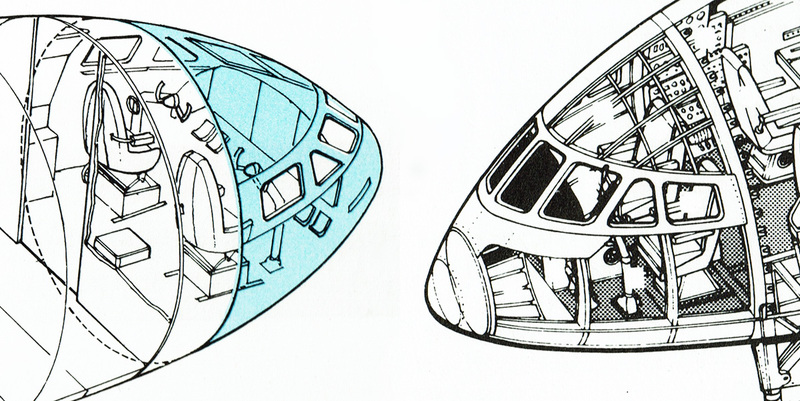 However, there is some dissimilarity in the detailing of the cockpit windows, of which the French ones admittedly are better in concordance with reality. The small pointy extensions between both couples of the jet engine exhausts represent the exhausts of two Sprite rocket engines, which were meant to provide extra thrust power during take off. They were never implemented (but still present in shape) in regular production type 1 Comets. Points of critique could be the rather crude landing gear and the too flat elliptical air intakes for the engines. Also the rather obvious seam between the two halves, especially the one behind the cockpit is not an aesthetical success (see picture above). The real Comet of this (first) type was a big failure, as commented already. Only 11 of this type (suitable for 36 passengers) were delivered. The first flight was in 1949, and it entered service in 1952, but it was kept aground in 1954 already, after six fatal crashes and it would never take off again in its original design. I think it’s most curious that the dramatic disasters with this plane apparently did not prevent Meccano from continuing the production and marketing of this Dinky model, and the buyers equally did not care much either, because a period of more than ten years (1954-1965) must be considered to have been a very satisfactory time span for the sales of this model. The fact that it is far from rare nowadays may confirm high production numbers. The model could not only give rise to unpleasant associations, it was also outdated very quickly, as the real one was deleted in 1954, and the considerably better Comet 4 - with obvious differences, especially in length, extra external fuel tanks on the wings, and much smaller fatigue resistant cabin windows - was introduced in 1958. So the Dinky model was still popular some ten years after several disasters and the actual withdrawal of the plane, and the children played happily with the model of a very dangerous – but nevertheless beautiful - aeroplane! The only adaption implemented by Meccano was the change of the registration number of one of the crashed planes (G-ALYV, crashed already on 2 May 1953 near Calcutta, a long time before the Dinky was in the shops, in October 1954) into a new one (G-ALYX). The real G-ALYX was delivered in July 1952, but it was scrapped only three years after, in June 1955. 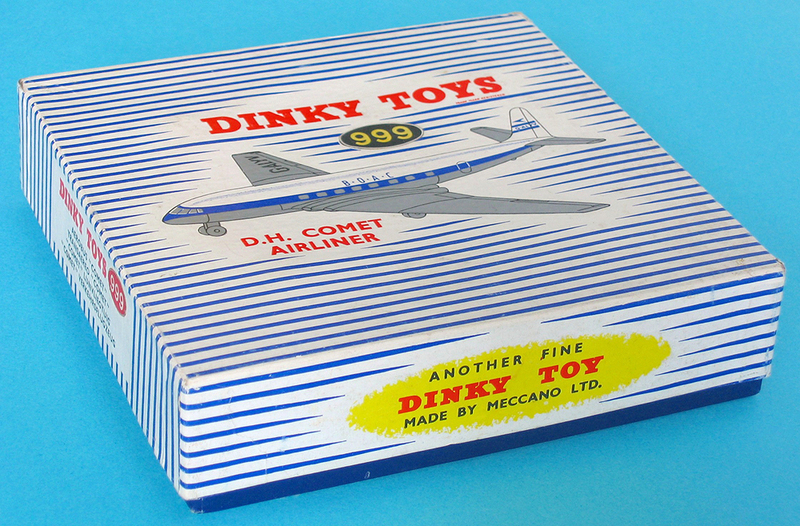 More about the Dinky Comet in Sue Richardson’s Diecast Toy Aircraft and on the very good site http://www.geocities.com/CapeCanaveral/Lab/8803/comet.htm. Diagram details from : Straalverkeersvliegtuigen (Haarlem : Oberon, 1981). PS: I do not have a record of the October 1954 Meccano Magazine. I am most curious about the review of this model in relation to the dramatic crashes (The Toyman most probably will have been very enthusiastic and positive about it, as usual). Perhaps somebody of the club can reproduce that review in this thread? Here is the URL of the google books page for Graham M. Simons' book 'Comet! The World's First Jet Airliner', which has the full story of this ground-breaking (no pun intended) aircraft. Jan—I , of course, had already read some time ago, your excellent write up on the Comet, on Talk Model Toys, but I thoroughly enjoyed reading it again....a testament to the thoroughness of your writing. It does seem a bit strange for Dinky to press on with production of such an ill-fated airplane, but I can only guess that due to the extremely good looking design of that prototype, maybe Meccano decided it would be popular and sell well anyway. I can only say that here in the US, I grew up totally ignorant of the real Comet and it’s sad history, but I loved the Dinky model, as did many other young collectors. Even looking today, I still think the Comet was one of the most attractive airliners ever built, and maybe Meccano played on that theme with producing it for so long.